PARTNERS SPOTLIGHT: HUG is grateful to the following Caring Communities Initiative Partners for supporting diapers to families in need. Together we are sending the message of of... "We care about you ... and we know what to do about it!" Rotary Club of Crystal, New Hope Robbinsdale -- for their generous donation pf $500 to the Diaper Bank of MN for HUG families! New Hope Women of Today! Thank you, New Hope Women of Today for the $500.00 donation to MN Diaper Bank for HUG families within Robbinsdale Area Schools. Your donation is appreciated and will cover many baby bottoms!! Thank you, ACORN MINI STORAGE -- for being a Diaper Bank Drop Off Site for the Diaper Bank of MN and HUG! New and opened packages of diapers, pull-ups and new packages of wipes can be dropped off at any of the 13 Acorn Mini Storage sites! Expecting? Adopting? Newborn or toddler? The birth or adoption of your child is a very special and joyful event. It can also be a time filled with questions and concerns about your new baby, your family and yourself. Sometimes it is nice to have someone to talk with for support before or after your baby arrives. Connections to additional home visiting programs, such as Healthy Families, Nurse Family Partnership and the Parent Child Home Program! A "Welcome New Baby" gift ....... and much more! All at no cost to you......because early learning lasts forever! 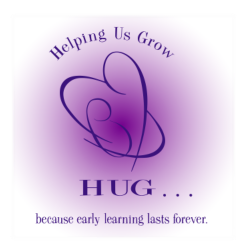 HUG visits are provided to families prenatal and postpartum to age two. To learn more about HUG, call 763-504-4983 or click on the "Contact Us/Request a Home Visit" page above and complete the information requested. Someone will contact you to answer your questions or arrange a home visit. Thank you to all who participated in the 2017 Celebration of Babies. Special thank you to our host, the NW YMCA and to our door prize donors: Go Health Chiropractic in Robbinsdale, Hennepin County HSPHD - Maternal and Child Health, Redesign Family Service Collaborative and Sustainable Resources. HUG is a Diaper Bank of MN partner. Want to donate those outgrown diapers in your child's closet? Need Diapers for your child? ​Contact HUG at 763-504-4983 -- we will redistribute donated diapers to those in need. Want to make a cash donation directly to the Diaper Bank of MN?